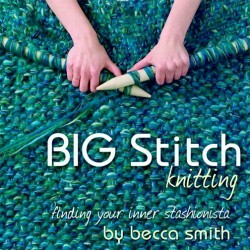 Becca's book is inspired by Rachel John's teaching in multi strand crafting. The book showcases more than two dozen stunning patterns created by Becca and her colleagues using the Extreme Knitting© needles designed by U.K. textile artist Rachel John. Becca's patterns allow knitters to create gorgeous, richly textured garments and home and fashion accessories in no time, using multiple fibres and needles ranging in length from 16" to 32".